Vegas Golden Knights fever extends well beyond the walls of T-Mobile Arena — bettors are swept up in it too. Nevada sportsbooks enjoyed a robust April with nearly $316 million in handle. That follows consecutive years of flat handle in April, a month featuring only The Masters as a major sports betting event. April produced $287 million in handle last year and $292 million in 2016. Finding the primary reason requires little effort. One needs only to look inside the nebulous “other” category in the Nevada Gaming Control Board’s revenue report. Nevada breaks out sport-specific revenue for football, baseball, and basketball. Sports including hockey, tennis, golf, and auto racing historically do not produce enough handle to warrant separate mention. “Other” experienced a 54 percent increase year-over-year in April from $39.3 million last year to $60.3 million in 2018. Give credit to hockey and its popularity boom in Las Vegas, as well as an unexpected surge in tennis betting. The NHL’s arrival in Las Vegas in October produced a surge in hockey betting that jumps off the page in April. 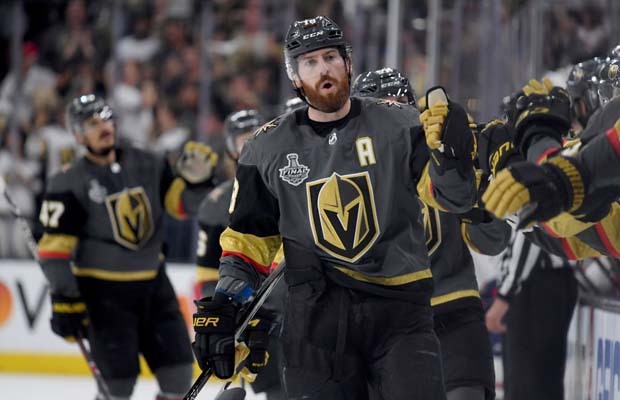 The expansion Golden Knights started their run to the Stanley Cup Final in April, playing their first seven games in the month. More betting did not lead to more success for books though. An April win percentage of 6.64 represents a steep drop from last year’s 14.29. Many books hold major liability if the Golden Knights raise the Stanley Cup. Vegas went off at 500-1 in some places and millions in potential losses reside in Golden Knights futures tickets. The Masters also anecdotally created more interest than in other years, thanks in part to the return of Tiger Woods. Sports win came in at $16.3 million in April. That’s a modest step up from $15.1 million last year and a nice leap from $13.5 million in 2016. Baseball and basketball handle held steady from past years. Hoops betting generated $122 million in April handle compared to $127 million in 2017 and $124 million two years ago. Handle from the diamond checked in at $125 million, up from $119.5 last year but down from $130 million in 2016. Football bettors snoozing after the Super Bowl came home to take $3.9 million in outstanding wagers from the books. A strong April bodes well for May for Nevada books, as the Golden Knights played an entire month of playoff hockey. They will play at least three more playoff games in June as well. The summer months usually bring less action to sportsbooks until college and pro football betting picks up in August and September.